"Spiritually Speaking" by Rev. 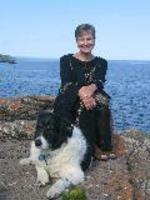 Carla Golden: Interview with Beryl Singleton Bissell, Author of "The Scent of God"
Interview with Beryl Singleton Bissell, Author of "The Scent of God"
As promised, here is my interview with Beryl Singleton Bissell, author of The Scent of God, the extroadinary memoir that I reviewed in my blog yesterday. I hope you enjoy it. Beryl, thank you for taking some time to answer a few questions. After reading The Scent of God, I am curious as to how your religious beliefs have changed since you were a nun? Do you perceive God any differently now? When I was a young nun, my religious beliefs came to me second hand. Although I’d had a mystical experience of God’s overwhelming and unconditional love as a teenager – an experience that led me into the cloister – it sank to the bottom of my consciousness as faith succumbed to dogma and fear took the place of love. I dismissed “experience” and clung to “truth” as it came to me through others authorized to teach the faith. These concepts were not necessarily what the Church embraced but what was interpreted to be church teaching. This was the status of my faith even as I left the monastery and married, but I did not recognize this until I began writing The Scent of God. I needed to examine what my beliefs were: Who was God? Did God demand and punish, or did God love and forgive? Writing The Scent of God, my daughter’s death and my growing life of interior prayer have shown me that God cannot be conceived of in words. We cannot wrap our minds around God. Thinking about or writing about God is not God. God is now. God is. This new faith has freed me to love and live in this abiding presence. Beryl, in your book you acknowledge your struggle with perfectionism, which I also have struggled with. Pope John Paul II addressed 20 new priests from various countries who were being ordained and told them the that Jesus wanted them to be perfect, "as your heavenly Father is perfect," quoting from the gospel of Matthew. He then went on to say, "In a word, the Lord wants you to be holy." How do you feel about the pope's message to young priests? What does perfect mean to you now? What an interesting question. What did Jesus mean when he asked us to be holy as his heavenly Father is holy? I am not a biblical scholar or a theologian but I do know how I interpret Jesus’ words. I believe that to be perfect means to open ourselves fully to God; to recognize that God is the source of life and strength and that of ourselves we are capable of nothing. We humans like to rely on our own strength, as if we are accomplishing things when it is actually God who accomplishes these things within us. We do not have the power to achieve perfection on our own. Our weakness and frailty are blessed gifts, revealing our helplessness to achieve on our own. The greater our awareness that “when I am weak, then I am strong” (2 Corinthians 12: 9-10) the more open we are to divine life. The more open to divine life, the more like the “Father” we become. So perfection in my terminology means awareness of weakness and confidence in God. Holy is another interesting word, derived from the term “to be whole.” Those who embrace and accept their humanity in its entirety, are holy or whole. God lives in and through them. In The Scent of God, Beryl, you share a message delivered by a Spanish priest that deeply touched you. He said: "Discover who you are. Go deep into your heart and claim the self you find there. Take that self out into the world with you. You have a mission. You are God's messengers." All these years later, what does that message mean to you? What do you think your mission and message are at this time in your life? Finding this mission is a lifelong task and one I believe we are given on a daily, hourly, even minute by minute basis. Every encounter, every event, reveal this mission. These are God’s entrances into our lives. Right now, my mission is to open myself to God’s presence, to write what I believe is the truth, and to give my full attention to the present moment and all that it entails. If I do this, God can shine through me and what better message can there be than that? This is a mission that we can all aspire to, Beryl. Thank you fo taking the time to share your thoughts and beliefs with us. You are a blessing!